Definition at line 12 of file CREFilterDialog.h. Definition at line 8 of file CREFilterDialog.cpp. References accept(), currentRowChanged(), CRESettings::loadFilters(), myFilters, myList, myName, myScript, onAdd(), onDelete(), onHelp(), refreshList(), reject(), and settings. Definition at line 50 of file CREFilterDialog.cpp. References myFilters, saveCurrentFilter(), CRESettings::saveFilters(), and settings. Definition at line 118 of file CREFilterDialog.cpp. References CREFilterDefinition::filter(), CREFilterDefinitionManager::filters(), myFilterIndex, myFilters, myName, myScript, CREFilterDefinition::name(), and saveCurrentFilter(). Definition at line 71 of file CREFilterDialog.cpp. References CREFilterDefinitionManager::filters(), myFilters, myList, refreshList(), saveCurrentFilter(), and CREFilterDefinition::setName(). Definition at line 81 of file CREFilterDialog.cpp. References CREFilterDefinitionManager::filters(), myFilterIndex, myFilters, CREFilterDefinition::name(), and refreshList(). Definition at line 66 of file CREFilterDialog.cpp. Definition at line 96 of file CREFilterDialog.cpp. References CREFilterDefinitionManager::filters(), myFilterIndex, myFilters, myList, and CREFilterDefinition::name(). Referenced by CREFilterDialog(), onAdd(), and onDelete(). Definition at line 58 of file CREFilterDialog.cpp. Definition at line 107 of file CREFilterDialog.cpp. 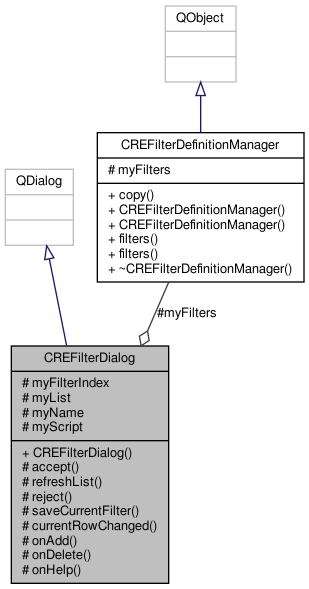 References CREFilterDefinitionManager::filters(), myFilterIndex, myFilters, myList, myName, myScript, CREFilterDefinition::name(), CREFilterDefinition::setFilter(), and CREFilterDefinition::setName(). Referenced by accept(), currentRowChanged(), and onAdd(). Definition at line 24 of file CREFilterDialog.h. Referenced by currentRowChanged(), onDelete(), refreshList(), and saveCurrentFilter(). Definition at line 23 of file CREFilterDialog.h. Referenced by accept(), CREFilterDialog(), currentRowChanged(), onAdd(), onDelete(), refreshList(), and saveCurrentFilter(). Definition at line 20 of file CREFilterDialog.h. Referenced by CREFilterDialog(), onAdd(), refreshList(), and saveCurrentFilter(). Definition at line 21 of file CREFilterDialog.h. Referenced by CREFilterDialog(), currentRowChanged(), and saveCurrentFilter(). Definition at line 22 of file CREFilterDialog.h.